reheat the oven to 350F degrees. Sift the flour, baking soda, baking powder, and salt. ream the butter & sugar until light and fluffy. Add the sour cream & raspberry extract. Then stir in the chocolate chunks. ivide the batter evenly among the liners and bake for 15-20 minutes, until done. For mini cupcakes, bake 12-14 minutes. For the icing: 1/2 cup of cream cheese 1 cup of sifted powder sugar 1/2 tsp. of vanilla extract 1/4 cup of butter ~~at; room temp. A half pint of fresh raspberries Beat cream cheese, powdered sugar, vanilla, butter and raspberries until smooth. 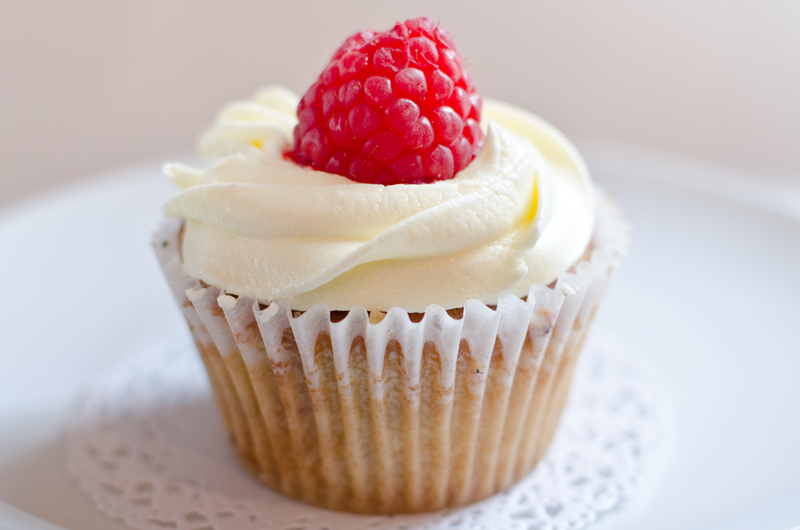 Top each cupcake with frosting and 1 raspberry, if desired..